Are you managing your assets as an asset? If “Data is the new oil!” is the rallying cry of the data scientist, then “Manage your data as an asset!” must be the battle cry of the data steward. Managing data as an asset is an interesting concept. How do we account for the value of data? Can we monetize data? What does this mean? Most organisations are struggling to account for tangible assets, such as inventory. At its simplest point, inventory is cash. If it is poorly managed, or accounted for, it can become a massive drain on cash flow – and even a liability. The multibillion dollar ERP industry promises to improve asset management by automating the key procurement and inventory management processes to improve efficiencies and reduce waste. Principals such as “just in time” ordering and spend analysis promise to improve cash flow by reducing wasteful spend, or by optimising spend behaviour so as to reduce stock levels to minimum requirements. Data is the Achilles heel of ERP. The ERP applications ability to deliver the desired business returns is only as good as the data which is captured into it. The Utilities company that has installed thousands of electricity meters that are all still registered as sitting in the warehouse at head office. Where is the customer? The online supermarket that moves stock from Cape Town to Johannesburg to service a fixed price delivery order, not realising that there is stock available in Johannesburg with a slightly different description. The listed institution that writes off tens of millions in expired stock, because it was lost in a warehouse somewhere for years. Questions about the monetization of data, or how we account for data as an asset are well and good. They make for a great debate over a glass of wine (if you are economically inclined). Yet they miss the key point. Data is how we represent our business. When our tangible assets are poorly represented we throw away money. The best opportunity to monetize data is internal. Data governance and product data quality are mechanisms to manage our physical assets by ensuring that they are correctly represented and managed in our systems. An Information Difference study shows that duplicate and erroneous information contaminate in teh region of 30% of typical product data master files. Shipping errors, time wasting, inaccurate financial reporting and many other problems stem from this reality. Treating asset data as an asset saves money! 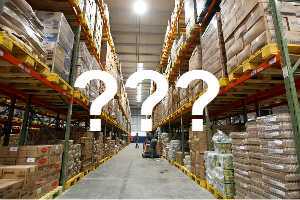 Contact us on +27114854856 for a discussion around improving your ability to manage your inventory. Excellent post, Gary, and one which echoes a theme we have been talking about for a while now: all of your examples are illustrations of the relationship between information ‘in the wild’ and the data that does, or in your examples does not, get accurately recorded as data. All of the software in the world will not solve the problems of “infidelity” between the real world and the digital one. I’ve been doing a fair bit of research into why IT projects fail and one of the books that really (albeit indirectly) nails it for me is James Gleick’s: The Information. Among other things, it’s about Claude Shannon’s theories that basically support the idea that It’s *all* information and that computers are simply a logical (binary) representation of reality. Combined with Barry Devlin’s notion that data is just technically enhanced information, I coined the phrase “Information in the Wild” to separate it as a class from information derived from data. Keep up the great posts…I always learn something from them.